For the second season in a row, Bryant Dunston of Olympiacos Piraeus has been chosen by Turkish Airlines Euroleague head coaches to win the Best Defender Trophy. As a shot-blocker, stealer and all-around immovable force, Dunston anchored an Olympiacos defense that proved the best of the 2014-15 season. The Olympiacos center becomes the only player besides six-time winner Dimitris Diamantidis to be voted the competition's best defender more than once. The Best Defender Trophy is the second in a string of 2014-15 EFES Euroleague Awards to be revealed this week. Dunston was among the Euroleague leaders in blocked shots and altered plenty more with his mobility and athleticism. Dunston's presence allowed Olympiacos perimeter defenders to play tougher, too, knowing that that he was backing them up. Games he played against some of the top centers in the Euroleague, including Ante Tomic of FC Barcelona, Sasha Kaun of CSKA Moscow and Nenad Krstic of Anadolu Efes Istanbul, shows that they posted scoring and performance index ratings below their averages when facing Dunston and Olympiacos. Those were among the many reasons Euroleague head coaches chose again to make Dunston this season's best defender! Following Dunston in the vote of Euroleague coaches were Nemanja Bjelica of Fenerbahce Ulker Istanbul, Dontaye Draper of Anadolu Efes Istanbul, Brad Oleson of FC Barcelona and Rudy Fernandez of Real Madrid. The first of the EFES Euroleague Awards was announced earlier this week; Taylor Rochestie of Nizhny Novgorod earned this season's Alphonso Ford Top Scorer Trophy. Other to be announced shortly include the Euroleague Rising Star Trophy and the All-Euroleague honorees. The bwin MVP award will be revealed at the EFES Euroleague Awards Ceremony on Thursday, May 14 in Madrid. The Alexander Gomelskiy Coach of the Year Trophy and the Euroleague Club Executive of the Year are post-season awards. Dunston ranked fifth in the Euroleague this season with 1.1 blocks per game and rejected at least 1 shot in all but six games. He was also one of just three players – joining Brian Randle of Maccabi Electra Tel Aviv and Jan Vesely of Fenerbahce Ulker Istanbul – with more than 20 blocks and 20 steals during the season. But more than individual statistics was Dunston's overall role in the Reds' fearsome defense. 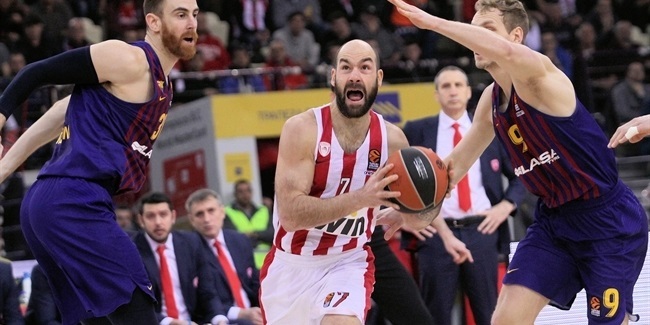 Olympiacos limited its opponents to league-lows of 71.2 points and 14.6 assists per game and was best among teams that played past the regular season in holding teams to 45.7% on two-point shooting. It's no coincidence that in the lone game Dunston missed this season, in Round 10 of the regular season at Galatasaray Liv Hospital Istanbul, Olympiacos allowed more points (79), a better two-point shooting percentage (52.8%) and more rebounds (37) than its season averages. 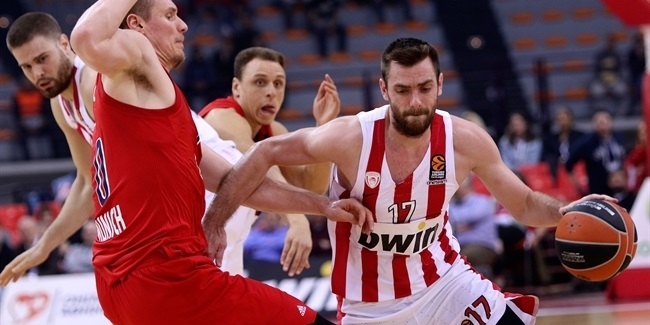 For the season, he started 23 games and led Olympiacos in blocks (1.1 bpg. ), while ranking second on the team in steals (0.8 spg.) and third in rebounds (4.5 rpg.) despite placing just sixth in minutes played (19:29). Dunston played at Fordham University before starting his professional career in South Korea, where he won the league title with Mobis Phoebus. He moved to Europe in 2010, first with Aris Thessaloniki of Greece, where he made his Eurocup debut before changing at mid-season to Bnei Hasharon of Israel. He spent 2011-12 with another Israeli side, Hapoel Holon, and the following season with Varese in Italy. Dunston signed with Olympiacos in the summer of 2013 and has anchored the Reds' defense in the two seasons since. The list of previous Best Defender Trophy winners includes Diamantidis (2005-2009, 2011) and Stephane Lasme (2103) of Panathinaikos Athens and Victor Khryapa (2010) and Andrei Kirilenko (2012) of CSKA Moscow. 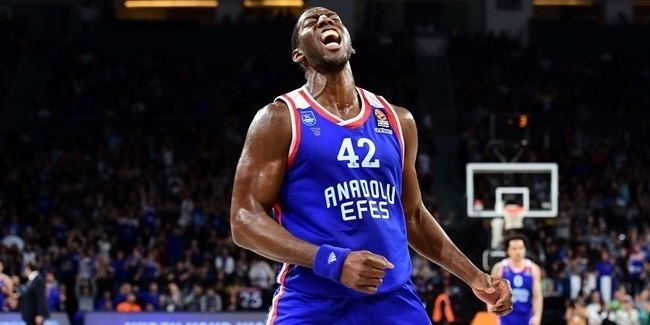 The Best Defender Award will be formally presented to Dunston at the EFES Euroleague Awards Ceremony during the 2015 Turkish Airlines Euroleague Final Four Madrid Tip-Off Event on Thursday, May 14.